With speeds up to 1550 cps and an MTBF rating of 20,000 power-on hours, the Epson DFX-9000 offers the power and durability to tackle the most demanding print tasks. Day after day, you can count on it to efficiently process everything from reports and 10-part forms to shipping documents or mailing labels. Its advanced paper handling capabilities make it the perfect solution for a wide variety of applications, including critical spreadsheets, checks, invoices, barcodes and more. With Parallel, Serial, and USB interfaces standard, plus a type-B slot for optional connectivity, the DFX-9000 easily attaches to new or legacy systems in standalone or networked environments. RF motor for use in DFX-9000 Impact Printer. Non-Cancelable/Non-Returnable. 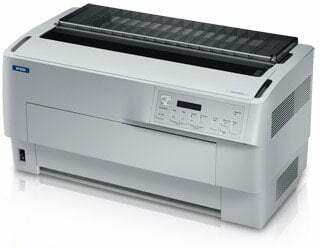 The Epson C11C605001NT is also known as Epson POS Products	EPS-C11C605001NT	.